Photo 1. The memorial to Taghavi near Balad, Iraq. 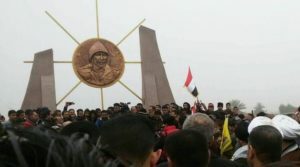 A monument dedicated to an Iranian general has been erected in Iraq for the first time in the country’s history. The landmark commemorates Hamid Taghavi (also known as “Abu Maryam”), a commander in the Islamic Revolutionary Guard Corps (IRGC) extraterritorial branch the Qods Force, with Taghavi’s legacy highlighting the reach of Tehran’s influence in Iraq. Located near Balad, a town 30 miles south of Samarra, the monument marks the site where an Islamic State bullet fatally wounded the 59-year-old in 2014. The memorial was unveiled in Sept. 2016, according to recent Iranian media reports. Through four decades and three wars, Taghavi was intimately involved in cultivating Shiite militias and directing their operations against Baathists, coalition forces, and the Islamic State. The Qods Force credited him with several high-profile operations, including one in which he oversaw an assassination attempt against Saddam Hussain’s son Uday. Born to a Shiite-Arab family in a village near Ahvaz in southwestern Iran, Taghavi spent most of his career in the Guard. According to his biography, Taghavi was politically active against the Shah and joined the Ahvaz IRGC branch’s intelligence unit after the monarch’s fall in 1979, and subsequently assisted in suppressing an Arab separatist insurrection. During the Iran-Iraq War (1980-1988), Taghavi commanded Guard units, and solidified his credentials at the Ramezan Base, a proto-Qods Force and a hub for conducting special operations and supporting Iraqi insurgents against Saddam. While at Ramezan in 1982, Taghavi helped set up the Badr Brigade, a powerful organization that today controls the Iraqi Interior Ministry. He later orchestrated from inception the “Mujahedin of Iraqi Hezbollah,” the Seyyed al-Shuhada Forces and the 15 Shaaban Movement, according to Iraj Masjedi, a senior Qods Force adviser and the incoming Iranian ambassador to Iraq. The latter group claimed the attempted assassination of Uday Hussein in 1996, and a former deputy to Taghavi credits the deceased commander with directing assassinations against the Iraqi leader’s son and other Baathist leaders. During the Second Gulf War (2003-2011), Taghavi was a senior commander in directing Qods Force operations in Iraq. According to the IRGC, Taghavi operated out of the Ramezan Central Base during the war, where he was responsible for coordinating a wide range of Iranian paramilitary and economic operations in Iraq. Throughout the war, the Qods Force extended training and combat support to sectarian Iraqi Shiite militias as they killed hundreds of coalition forces and led death squads against Sunni civilians. Taghavi had at least one encounter with US forces, according to his wife, who recounted a story told by an Iraqi colleague. US troops detained Taghavi, who had a bounty on his head, and two Iraqis at a check point during curfew, but released them after failing to identify Taghavi. In 2012 or 2013, he retired as brigadier general. Yet, Taghavi returned to the battlefield in 2014 as part of an Iranian expeditionary force after the Islamic State incursion into Iraq and the collapse of Iraqi security forces. Taghavi and his fellow Qods Force comrades – including Major General Qassem Soleimani – organized Shiite militia operations in coordination with Iraqi security and Kurdish forces, and, at times indirectly or directly, with the US. Indeed, Soleimani’s much-publicized presence near the Iraqi battlefields underscored the deep involvement of Qods Force operatives. Photo 2: Qods Force commander Taghavi and what appears to be Iraqi federal police. Photo 3: Qods Force commander Hamid Taghavi, Khorasani Companies commander Hamed Jazayeri and what appears to be Iraqi federal police. Taghavi was involved in defending Samarra and securing the Karbala-Baghdad road, as well as operations that pushed the Islamic State away from the border with Iran, according to a former comrade and the translations of an IRGC commander’s statements first published in Iran Wire. Soleimani and Taghavi were furthermore credited with contributing to a 2014 victory over the Islamic State in Jurf al-Sakhar, a small village south of Baghdad, where Iraqi forces secured a vital road for a Shiite pilgrimage. Taghavi operated as both advisor to Iraqi militias and commander of a formation. In fact, Taghavi personally rebranded the Khorasani Companies – a Shiite militia with a political wing that fought in the Syrian civil war and swears allegiance to Iranian Supreme Leader Ali Khamenei – following Grand Ayatollah Ali Sistani’s 2014 fatwa to drive the Islamic State from Iraq. In an Iranian documentary on Taghavi, the fluent Arabic speaker is taped in Dec. 2014 orchestrating battle plans for the Balad front and calling on his Iraqi colleagues to allow greater flexibility to commanders on the ground. The stakes were high: loss at Balad could have led to the fall of Samarra, site of one of Shiite Islam’s holiest shrines, which in turn could have threatened Baghdad. Photo 4: Hamid Taghavi, middle, with Iraqi militia commanders. Photo 5: Khorasani Companies poster of Qods Force commander Hamid Taghavi, a “commander and founder” of the group. The militia’s logo bears an identical resemblance to the IRGC’s. The documentary portrayed Taghavi as a reserved Iranian commander who had a strong rapport with the local Iraqi militias. He directed troops at the frontlines, spoke with an Iranian embedded in the Khorasani Companies, and personally led a tactical unit in one operation. 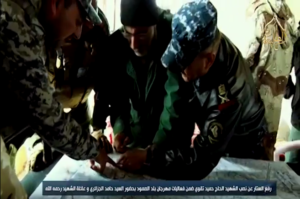 After he was wounded and evacuated from the battlefield, the militiamen were inspired to victory – chanting for “revenge over the blood of Abu Maryam,” according to the Khorasani Companies. The ability to forge ties in Iraq served Taghavi well during his long career. He played a key role in the formation of dozens of Iraqi militias in Iraq in addition to the Khorasani Companies, and trained thousands, according to the documentary. Qods Force commander Masjedi echoed that claim in the same documentary, acknowledging that Taghavi formed other jihadi groups alongside the Khorasani Companies in 2014 as well as earlier groups dating back to the 1980’s. The Khorasani Companies has glorified Taghavi in the months following his death. The group has produced at least two music videos honoring Taghavi. The latest was released in January with verses in Arabic and Farsi. 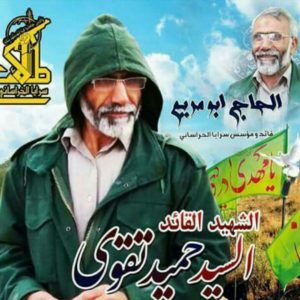 “Oh you dear martyr, commander of the battalion,” sings an Iraqi artist, “may your heaven be blessed, my dear martyr Taghavi … we will forever stay in the path of your jihad.” The Khorasani Companies also named a training facility after him in Sept. 2015. 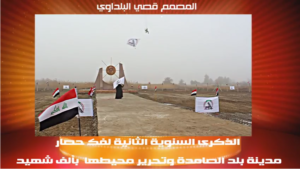 In another Taghavi tribute video, the winner of a marathon race, which was held to commemorate the second anniversary of the Balad victory, hoists by the memorial the flag of the Iraqi Popular Mobilization Forces (PMF), the umbrella organization of diverse militias formed following Sistani’s 2014 fatwa (photo 6). The Khorasani Companies is part of the PMF, in which IRGC-backed groups are now the dominant formations. The Iraqi government enshrined the PMF into a parallel military institution last year. According to Taghavi’s wife, he had a role in forming the PMF, as well. The IRGC has cultivated organic support within Iraqi society and government through operatives like Taghavi. The IRGC-backed network is working to ensure that it emerges victorious in Iraq following the battle of Mosul. This network is implementing a long-term plan to strengthen its hold in the country. Any effective strategy to roll back this influence must prioritize supporting Iraqis who wish to forge an independent future.